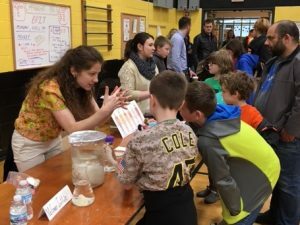 Two team members from the laboratory of McGowan Institute for Regenerative Medicine deputy director Stephen Badylak, DVM, PhD, MD, recently represented the McGowan Institute at an educational outreach activity held at McKnight Elementary School in the North Allegheny School District. Michelle Scarritt, PhD, and Abby Stahl explained to students and their families how different human anatomy systems function. Dr. Scarritt explained how the lungs work after showing the kids the rodent lung bioreactor. Our intercostal muscles and diaphragm work in unison to lower the pressure in our chest cavity. The pressure of the air in our lungs is then higher causing them to expand. 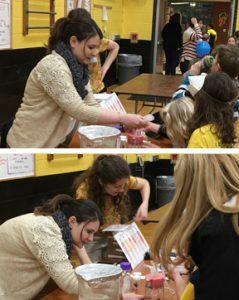 Ms. Stahl and Dr. Scarritt demonstrated how humans breathe using rodent lungs in a bioreactor. The kids removed air from the bioreactor chamber (using a syringe) to create a vacuum that allowed the rodent lungs to inflate with air. When air was pushed back into the chamber, the lungs collapse. They also talked about the function of our liver and how our cardiovascular system works. Dr. Scarritt received her PhD from Tulane University in New Orleans, LA, where she studied lung tissue engineering. Through her experience with lung decellularization and recellularization within bioreactors, Dr. Scarritt now hopes to develop vascularization strategies for liver engineering applications. She is also interested in assessing the rate of ECM turnover during recellularization as a means of predicting clinical outcomes for porcine organ scaffolds. Abby Stahl is an undergraduate at the University of Pittsburgh studying bioengineering with a concentration in cellular and tissue engineering. Her current research interests are focused on engineering functional liver tissue by developing novel methods of seeding hepatic cells within a 3-dimensional scaffold composed of extracellular matrix.